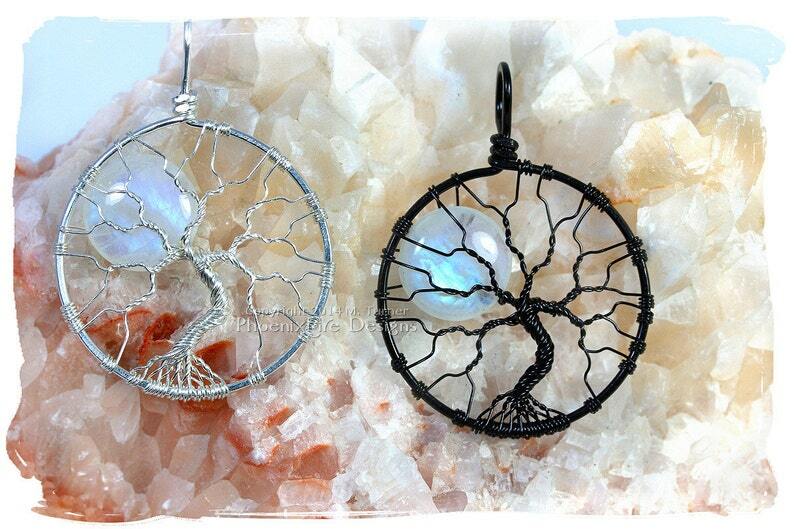 Natural blue flash Rainbow Moonstone necklace, celestial jewelry Full Moon Tree of Life Pendant hand wire wrapped in reclaimed, eco friendly Argentium sterling silver or black wire natural moonstone jewelry. Lunar Jewelry, celestial Statement necklace by artisan maker Miss M. Turner of Phoenix Fire Designs. 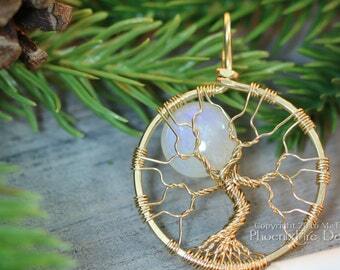 This is the largest natural rainbow moonstone tree I've ever been able to offer. I worked directly with a lapidary in India to get these stunning 100% natural blue fire rainbow moonstone gemstone coin beads made in such a massive 16mm size! 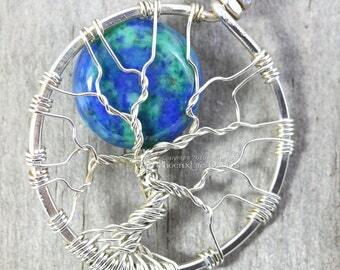 This pendant is handmade using painstaking wire-wrapping techniques in your choice of solid (not plated) non-tarnish Argentium sterling silver wire or permanently colored black wire (over copper core.) The wire is hammered by hand both for aesthetic appeal and to help strengthen and temper the frame. Made with a touch of germanium, Argentium® Silver presents a bright white color that is closer to fine silver than traditional sterling, yet is extremely slow to tarnish under most conditions. With 93.5% pure silver, Argentium exceeds the legal standard to be quality-marked as sterling silver. All Argentium is made from reclaimed silver and its sources are guaranteed by Argentium International Ltd. Argentium silver is 100% nickel free. The black wire is permanently colored by the manufacturer over a copper core. It's the same wire I use in all my black tree options. This tree is bare of leaves like one would see in Winter and features a large, rainbow moonstone "full moon" peeking out from behind the branches. This piece has a very mystical feeling to me and a stillness to it as well. Rainbow moonstone is an amazing stone that's almost impossible to photograph. The stone is a milky white but comes "alive" with iridescent fire and a color shift towards blue in various types of light. 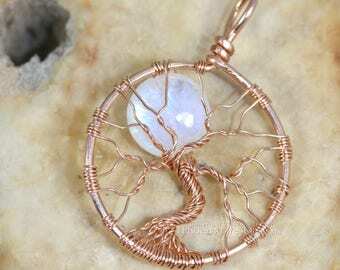 Moonstone is of course associated with the Moon and with the Goddess Diana. It's a powerful stone said to protect those of a sensitive nature and bring good emotions to the wearer. Because of it's tie to emotions and the moon, it's said to be a woman's gemstone. 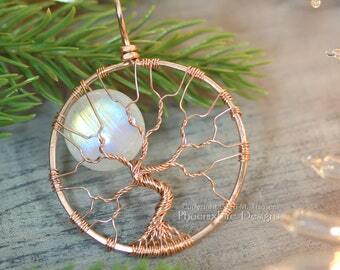 LISTING IS FOR ONE TREE IN YOUR CHOICE OF BLACK OR SILVER WIRE. CHAIN SOLD SEPARATELY. Each and every piece of PhoenixFire Designs jewelry is handcrafted from scratch by artisan maker and jewelry designer M. Turner in her Tampa Bay Area, Florida studio. All items are handmade and made in the USA. By it's very nature, handmade jewelry is going to be inherently more delicate than something mass-manufactured. It's important to always apply the "last on; first off" rule meaning put your jewelry on last when getting ready and take it off first. Permanent wire coatings, protective coatings, non-tarnish finishes and gemstones can be damaged by exposure to various chemicals, including things like lotions, hairsprays and perfumes among others. It's also important to NEVER submerge handmade jewelry in any kind of liquid, nor use any abrasive clothes, brushes or cleaners as it can damage the piece. Do not wear in the shower, tub, pool or other time when the piece may get submerged in water.